On Friday, my 3 nieces had off from school for the holiday weekend, so they came over to play with Grace. My Mom stopped by for a visit later in the day, too. So, I saw this as an opportunity to have our first picnic lunch on my new-to-me, vintage patio set. I served up some mac and cheese, hot dogs, and watermelon punch! Isn't that tray the cutest? I found it in the Dollar Spot at Target! I have a feeling you'll be seeing it a lot this summer! I also saw it as an opportunity to try a new recipe that I found online earlier in the week. The recipe is for a smoothie made with Xigua Melon (you know, those really cute, little watermelons). I didn't have a Xigua Melon, but I did have a normal-sized, seedless watermelon cut into chunks in my fridge that I wanted to use up. Perfect! crushed some ice and added to my blender. added the watermelon and water. add sugar or sweetener to taste. Now, this uses a lot of watermelon. Be careful not to munch on too many chunks of watermelon while drinking this punch, while also snacking on cheese curls. That combination causes a really bad belly ache....just sayin'! oh wow....this looks yummy! Thanks for sharing :) found you and following you from I heart naptime! Have a great weekend! 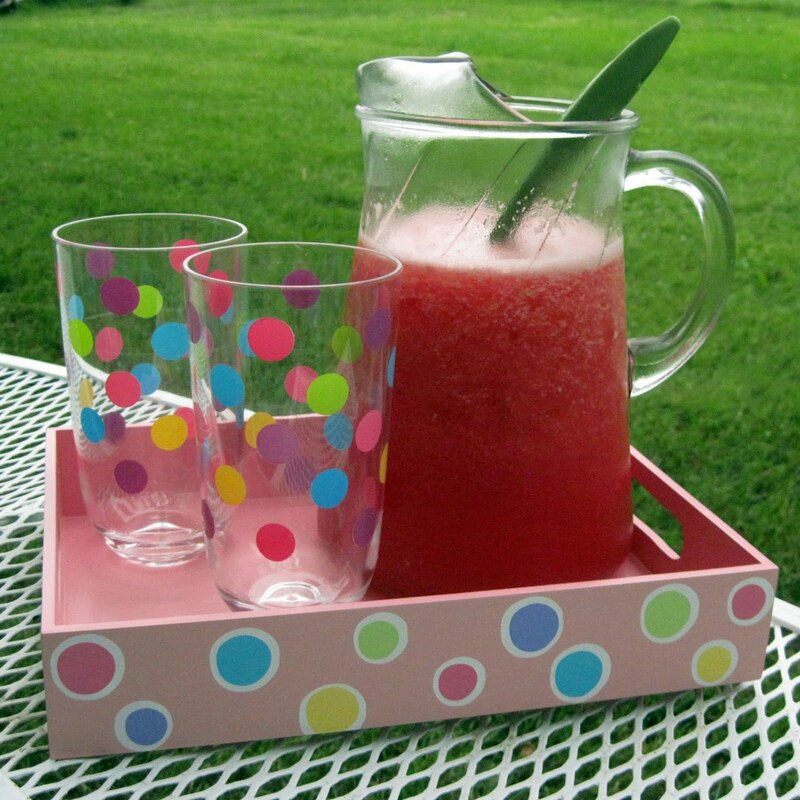 Love the tray and the glasses!I make a lot of these slushies/smoothies especially during summer.I found you from the foodie blog roll and I'd love to guide Foodista readers to your site. I hope you could add this watermelon widget at the end of this post so we could add you in our list of food bloggers who blogged about watermelon,Thanks!